*Includes the SMA 400 appliance, 25 concurrent users and 24x7 support for up to the specified number of users. 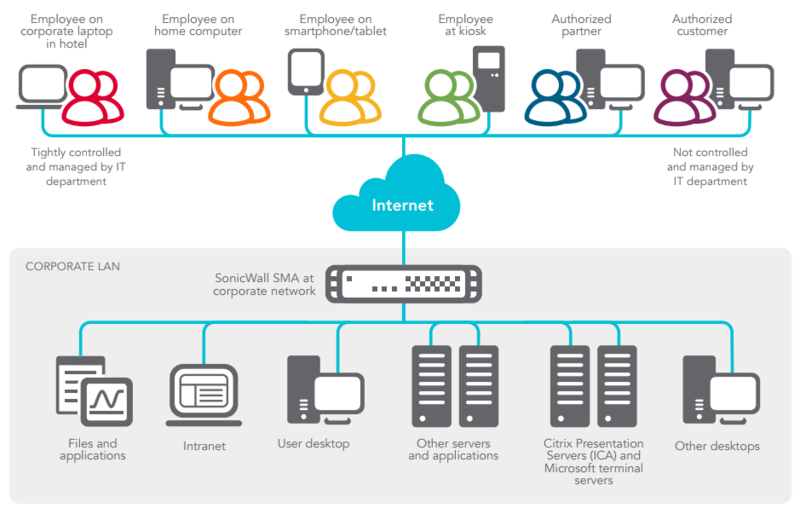 The SonicWALL Secure Mobile Access (SMA) 100 Series provides mobile and remote workers using smartphones, tablets or laptops - whether managed or unmanaged BYOD - with fast, easy, policy-enforced access to missioncritical applications, data and resources, without compromising security. For mobile devices, the solution includes the intuitive SonicWALL Mobile Connect app that provides iOS, Android, Kindle Fire, Windows, Chrome and Mac OS X devices secure access to allowed network resources, including shared folders, client/server applications, intranet sites and email. Users and IT administrators can download the Mobile Connect app via the Apple App Store, Google Play, Kindle and Microsoft store. The solution also supports clientless, secure browser access, including support for industry standard HTML 5 browsers and thinclient VPN access for PCs and laptops, including Windows, Mac OS X and Linux computers. To protect from rogue access and malware, the SMA 100 Series appliance connects only authorised users and trusted devices to permitted resources. When integrated with a SonicWALL nextgeneration firewall as a Clean VPN, the combined solution delivers centralized access control, malware protection, application control and content filtering. The multi-layered protection of Clean VPN decrypts and decontaminates all authorised SSL VPN traffic before it enters the network environment. The proliferation of mobile devices in the workplace has increased the demand for secure access to missioncritical applications, data and resources. Granting that access offers important productivity benefits to the organization, but introduces significant risks as well. For example, an unauthorised person might access company resources using a lost or stolen device; an employee's mobile device might act as a conduit to infect the network with malware; or corporate data might be intercepted over third-party wireless networks. Also, loss of business data stored on devices can occur if rogue personal apps or unauthorised users gain access to that data. Securing these devices is becoming increasingly difficult, as organizations may no longer influence device selection or control device management. Organizations must implement solutions that safeguard access to ensure only authorised users and devices that meet security policy are granted network access, and that company data in-flight and at rest on the device are secure. Unfortunately, this often involves complex multi-box solutions from multiple vendors and adds significantly to the total cost of ownership behind providing mobile access. Organizations are looking for easy-to-use, cost-effective and secure mobile access solutions that address the needs of their increasingly mobile workforces. Enable users to access applications and data from anywhere so they stay productive, and keep your company competitive. Designed for organizations with up to 250 remote employees, the SonicWALL Secure Mobile Access (SMA) 400 Appliance provides medium-sized businesses with a high performing, easy-to-use and cost-effective SMA solutions that require no pre-installed client software. SMA 100 Series lowers IT costs by enabling network managers to easily deploy and manage a single secure access gateway that extends remote access via SSL VPN for both internal and external users to all network resources - including web-based, client/server, host-based (such as virtual desktop) and back-connect applications (such as VoIP). SMAs are either clientless with browser access to the customizable SMA Workplace portal or use mobile apps or lightweight web-delivered clients, reducing management overhead and support calls. SMA technology provides transparent access to network resources from any network environment or device. A SMA appliance provides a single gateway for smartphone, tablet, laptop and desktop access and a common user experience across all operating systems - including Windows, Mac OS X, iOS, Android, Kindle, Chrome and Linux - from managed or unmanaged devices. Mobile Connect app for iOS, Mac OS X, Android, Kindle, Chrome and Windows mobile devices provides users with easy, network-level access to corporate and academic resources over encrypted SSL VPN connections. Mobile Connect is easily downloadable from the Apple App Store, Google Play, Microsoft or Kindle store and embedded with Windows 8.1 devices. Provides end-users a rich access experience within their own choice of web browser, which eliminates their need to download, install and maintain additional software on their systems. Everything can be run from within the context of the browser window, making connection to resources very easy and zero day support for all major OSs and browsers. Access to the corporate network is granted only after the user has been authenticated and mobile device integrity has been verified. 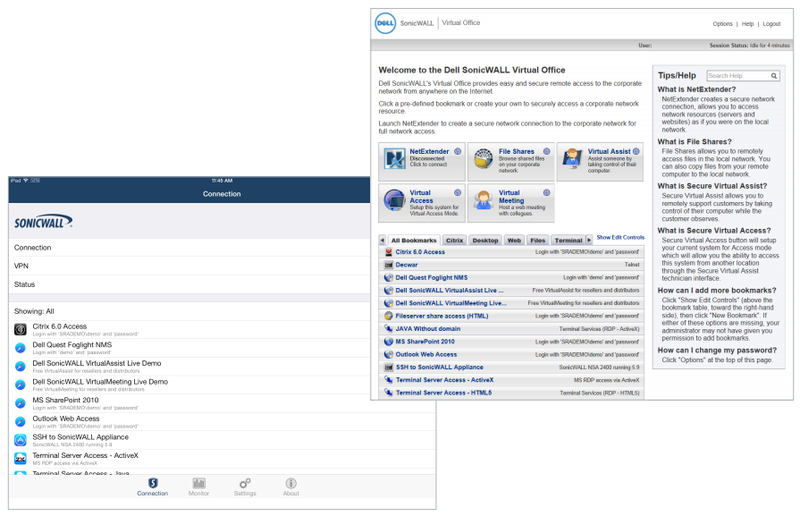 Authenticated users can securely browse and view allowed intranet file shares and files from within the Mobile Connect app. Administrators can establish and enforce mobile application management policy. Adaptive addressing and routing - Dynamically adapts to networks, eliminating conflicts common with other solutions. All SMAs are easy to set up and deploy in just minutes. The setup wizard provides an easy, intuitive “out-of-the-box” experience with rapid installation and deployment. Easy-to-use wizards to deploy policies for OWA, ActiveSync, Outlook Anywhere and Autodiscover. This saves IT administrators considerable time for the most commonly created policies, making them more productive and lowering the company's overall TCO. SMA unified policy offers easy, object-based policy management of all users, groups, resources and devices while enforcing granular control based on both user authentication and endpoint interrogation. Helping to secure internal web applications from remote users, SonicWALL’s award winning WAF engine has been enhanced to detect against additional exploits and threats. This allows customers to ensure the confidentiality of data, and internal web services remain uncompromised, should there be malicious or rogue authenticated user access. Grants customers with a mechanism to allow or restrict user access from various geographical locations. Also provides additional protection from compromised endpoint participating in a botnet, further verifying the validity of the connecting device. The SMA 100 Series can be used to provide Windows, Mac OS X, iOS, Linux, Android, Chrome and Kindle users with access to a broad range of resources. Best-in-class, context-aware authentication grants access only to trusted devices and authorised users. Mobile devices are interrogated for essential security information such as jailbreak or root status, device ID, certificate status and OS versions prior to granting access. Laptops and PCs are also interrogated for the presence or absence of security software, client certificates, and device ID. 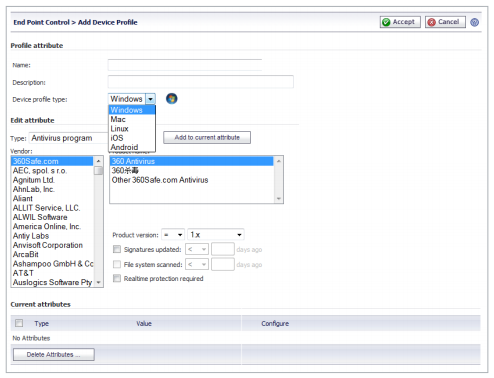 Devices that do not meet policy requirements are not allowed network access and the user is notified of non-compliance. Authenticated Mobile Connect users can securely browse and view allowed intranet file shares and files from within the Mobile Connect app. Administrators can establish and enforce mobile application management policy for the Mobile Connect app to control whether files viewed can be opened in other apps (iOS 7 and newer), copied to the clipboard, printed or cached securely within the Mobile Connect app. For iOS 7 and newer, this allows administrators to isolate business data from personal data stored on the device and reduces the risk of data loss. In addition, if the user's credentials are revoked, content stored in the Mobile Connect app is locked and can no longer be accessed or viewed. When deployed with a SonicWALL next-generation firewall, Mobile Connect establishes a Clean VPN, an extra layer of protection that decrypts and scans all SSL VPN traffic for malware before it enters the network. SMA 100 Series solutions feature unified policy and an intuitive webbased management interface that offers context-sensitive help to enhance usability. In addition, multiple products can be centrally managed using the SonicWALL Global Management System (GMS 4.0+). Resource access via the products can be effortlessly monitored using the SonicWALL Analyzer reporting tool. The SMA 100 Series extends secure mobile and remote access beyond managed employees to unmanaged mobile and remote employees, partners and customers by employing policy-enforced fine-grained access controls. The SonicWALL Web Application Firewall Service offers businesses a complete, affordable, well integrated compliance solution for web-based applications that is easy to manage and deploy. It supports OWASP Top Ten and PCI DSS compliance, providing protection against injection and cross-site scripting attacks (XSS), credit card and Social Security number theft, cookie tampering and cross-site request forgery (CSRF). 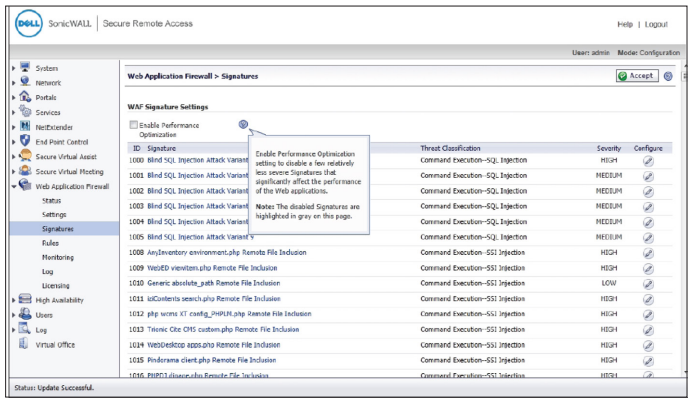 Dynamic signature updates and custom rules protect against known and unknown vulnerabilities. Web Application Firewall can detect sophisticated web-based attacks and protect web applications (including SSL VPN portals), deny access upon detecting web application malware, and redirect users to an explanatory error page. It provides an easy-todeploy offering with advanced statistics and reporting options for meeting compliance mandates. Incoming traffic is seamlessly forwarded by the SonicWALL NSA or TZ Series firewall to the SonicWALL SMA appliance, which decrypts and authenticates network traffic. Users are authenticated using the onboard database or through thirdparty authentication methods such as LDAP, Active Directory, Radius, Dell Defender and other two-factor authentication solutions. A personalized web portal provides access to only those resources that the user is authorised to view based on company policies. to create a Clean VPN environment, traffic is passed through to the NSA or TZ Series firewall (running gateway anti-virus, anti-spyware, intrusion prevention, and application intelligence and control), where it is fully inspected for viruses, worms, Trojans, spyware and other sophisticated threats. Mobile Connect and NetExtender: Any TCP/IP based application: ICMP, VoIP, IMAP, POP, SMTP, etc. 1 The recommended number of users supported is based on factors such as access mechanisms, applications accessed and application traffic being sent. 2 Available in conjunction with Secure Virtual Assist for SMA 400 and SRA Virtual Appliances only. 3 Refer to the latest SMA 100 Series release notes and admin guide for supported configurations. 4 Botnet filtering and Geolocation-based policies require an active support contract to be in place on the hardware or virtual appliance.